On Dec. 15, 2016, the stewards at Laurel Park issued a brief statement following the hearing of trainer Wayne Potts. 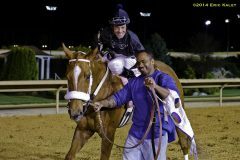 Potts, who is based in Maryland and Delaware and has trained since 2004, was found to have operated his racing stable without workers' compensation insurance from Aug. 31, 2015 to March 16, 2016. The trainer, ranked 87th in the country by wins last year, was fined $1,500 for the offense. A former employee of the Potts stable said there's something about that which doesn't sit right with her. The exercise rider, a former trainer who requested her name not be used, had been working horses for Potts in the mornings when one went down with her on the morning of Feb. 19. Her head injuries were severe enough that an assistant in the shedrow took her to a nearby hospital. When the bills starting coming in a few weeks later, the rider said she asked Potts to provide her a claim number from his workers' compensation policy to pay for the expenses not covered by her medical insurance. She thought the matter was resolved until she was rejected for an apartment rental in Florida a few months later. She was told her credit score was too low, and when she did some digging, she found out it was because the hospital bills had defaulted to her. The claim number she had been given was invalid for her accident; on the date of her fall, Potts had no insurance. State database records indicate Potts cancelled his policy in August 2015 and didn't reinstate it until several weeks after his employee's fall. According to those records, the policy was cancelled, not expired. Potts did not respond to a list of questions from the Paulick Report about the incident. The stewards' ruling has left her worried about the precedent that could be set for trainers in the future looking to cut costs – and costs related to workers' comp can be high. Workers' compensation insurance has been a thorn in the side of racing operations for as long as many horsemen can remember. In most states, workers' comp is required of anyone who has employees as a matter of law, and rates are determined by the amount of risk involved in the job. Unsurprisingly, working on the backstretch of a racetrack is typically in the most expensive rate group because of the high-risk nature of the work. The system for funding workers' comp for grooms, hotwalkers and other barn staff varies slightly by state and even by racetrack. In the Mid-Atlantic region, tracks require trainers to submit proof of their current workers' comp policy before they may be granted stalls, and states may also require a trainer to have proof of insurance to obtain a license, even if they don't plan to hire employees. Tracks make note of when a policy is due to expire, and trainers are supposed to provide proof of renewal, though some tracks are more rigorous about checking up on a trainer's insurance status than others. Trainers purchasing insurance from the limited number of carriers still willing to provide it to horsemen have seen costs rise each year as the cost of insurance and healthcare generally increases. The charge to the horseman is determined by the amount of their payroll, with a given rate per $100. Those rates also vary by state, but Hoffberger says they are about $12 per $100 in Maryland, and may be as high as $18 or $19/$100 in high-cost states like New York, New Jersey and Pennsylvania. In these states, employees like exercise riders who work for more than one trainer also have their portions of workers' comp coverage split between the various employers. That means payroll record-keeping is especially important, and experts say it's easier for trainers to cheat the system, which raises costs for everyone else. Even small operations with no employees can be hit with a high bill for workers' comp. Potts' former exercise rider remembers paying $2,000 per year for her own coverage when she was a one-person operation. Hoffberger points out that even a medium-sized operation with 10 employees may have a payroll of $4,500 per week, which means the trainer's workers' comp bill comes to $540 per week. That money adds up quickly, especially if a trainer is struggling to make ends meet. Again, depending upon the state, jockeys and/or exercise riders may be taken care of separately. Jockeys are generally recognized as independent contractors, since very few American operations hire them on exclusive contracts these days. 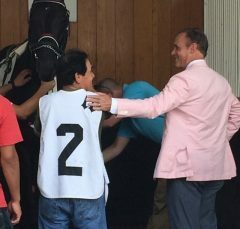 Exercise riders may be independent contractors, although some spend part of their career working exclusively for one operation (as was true in the Potts case); sometimes, their insurance is addressed in combination with jockeys; other times, it's rolled into the policy for backstretch workers. It's challenging to keep track of a payroll that varies by the day with which riders are working. Some trainers pay cash, others skip paying overtime, and some may lie about how many employees they have, all to get a break on workers' comp insurance. Experts say that's part of the reason rates keep rising; trainers who don't try to play the system are left holding the bag for the number of claims. In New York, New Jersey, and Maryland, jockeys are considered employees for the purpose of workers' comp insurance and have their insurance paid for by horsemen. In other states, including Pennsylvania and Kentucky, they're considered independent contractors and the expense of coverage falls on the racetracks. In some states, the limit on claims for such policies may be as little as $1 million, which doesn't go far if a jockey is involved in a catastrophic fall and is paralyzed. New York's horsemen have tried to create a self-insurance fund to cover jockeys and exercise riders, but legislation allowing for alternative coverage like this was vetoed by Gov. Andrew Cuomo late last year. Horsemen in California ultimately came up with their own solution to the workers' comp issue. In the late 1990s and early 2000s, rates had jumped to an average of $60 per $100 of payroll for private carriers, and trainers were leaving the state. California trainers came together to create a self-insurance group, in which they pay a flat rate into a fund that covers employees of its members, including jockeys, in the event of a claim. The group, called Finish Line Self-Insurance Group, charges trainers based not on payroll but on the number of stalls they rent. This year's cost is $2.95 per horse per day, which McKinzie estimates puts yearly costs to trainers at 40 to 45 percent below what private insurance carriers would charge. Finish Line also works directly with tracks and the California Horse Racing Board to make sure trainers who fail to pay for their coverage have stalls revoked and entries blocked if necessary. Why doesn't every state have a self-insurance group? McKinzie said there are three critical elements that keep Finish Line going. First, someone must agree to be the financial back-up plan if a self-insurance group can't pay its bills. In California, Los Alamitos owner Dr. Ed Allred stepped up when the group was formed, vouching for a yearly budget that's now around $13 million. McKinzie said the group has never required a bailout from Allred. Second, the group needed a subsidy to offset its costs. Finish Line gets half its budget (around $6.5 million) subsidized from exotic wagers in the state. Half of one percent of exotics is deposited into the group's account. Finally, the group must also pay for excess insurance to protect itself from large claims. Finish Line is on the hook for up to $1 million per claim, but California law places no limits on the value of a workers' compensation claim, so the group has a policy with Midlands Management of Oklahoma to pick up the tab for claims exceeding $1 million. McKinzie said to his knowledge, Midlands is the only company that will provide such a policy. So far, he said, horsemen in other states who have explored this option have struggled to get all three elements in play to keep a self-insurance group working, but Finish Line has made a big difference for California trainers. Alan Foreman, attorney and general counsel to a number of Mid-Atlantic horsemen's groups, said officials in Maryland have looked at captive insurance, self-insurance, and policies funded by offshore providers. Nothing has panned out yet. In lieu of a more cost-effective solution, Foreman suggests trainers take a long look at safety in their shedrows to reduce the likelihood of claims, which ultimately raise their costs. Foreman and Hoffberger agree it's unusual to see a trainer sanctioned for failure to carry workers' comp insurance; for most, they figure the risk of being caught or having an employee injured on the job would be too great. “I don't think it happens very often. You don't really hear in Maryland of stories where lots of people don't have coverage,” said Hoffberger, who noted some states don't require an employer to have workers' comp for just a few employees, although tracks do. The rider in the Potts case questions whether horsemen will continue to pay for policies if they know their punishment is likely to be less than the money they saved in premium payments. There's also the question of eligibility for horses Potts started during the time he was uninsured. Had tracks been aware of his status at the time of entry, those horses would not have been eligible to run, per regulations and stall contracts in those states. During this time, Potts runners started over 330 times in West Virginia, Maryland, Delaware, and Pennsylvania. It's easy to wonder what also-rans in those races think about losing purse money to Potts under the circumstances. “He got fined $1,500, which is cheaper than a worker's comp policy, so he got away with not doing things right and it was still cheaper for him,” the former employee said. “They've set the precedent of what it costs when you do something like this, and it's cheaper. Correction: An earlier version of this story cited a significant fine ($5,000) levied against another trainer, Michael Pino, for failing to be present to saddle his horse ahead of a race at Laurel Nov. 5. Maryland officials have since clarified the fine amount was printed incorrectly on the rulings report, and was in fact $50. This entry was posted in NL Article, Ray's Paddock and tagged aryland racing, Brad McKinzie, dr. ed allred, exercise riders, Finish Line Self Insurance Group, grooms, Jockeys, los alamitos, Maryland Racing Commission, wayne potts, worker safety, workers' compensation, workers' compensation insurance by Natalie Voss. Bookmark the permalink.